This should be easy, right? Intuitive? We don’t need checklists for how to be friends with our other friends, so why do we need this? There is something inherently different about being friends with someone who holds a position of authority. It doesn’t mean one position is better than another—in fact, my pastor says that pastors aren’t at the top but at the bottom. This kind of leadership is an inverted pyramid, and everything filters down—to and through the pastors. The church members come first, at the top, and below that, the elders and teachers who serve them. And below that are the pastors, who serve all those above. For many years, my husband and I have been close friends with Nathan and Peggy, our co-pastors. Ours is a small church, like family, but sometimes that means everyone gets up in everyone else’s business. I’ve watched Peggy struggle to maintain relationships as she’s embraced her role within the church. 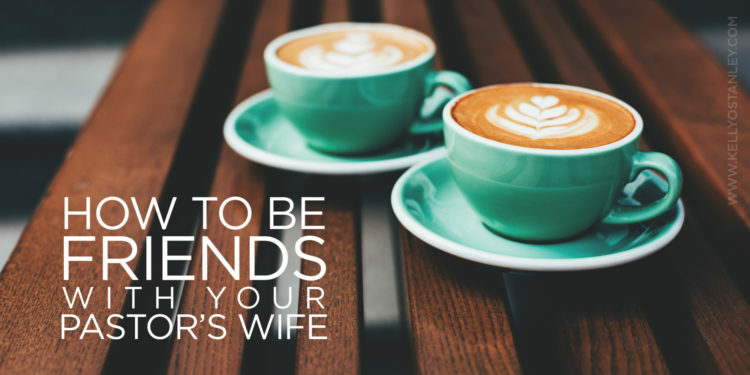 Seeing the ways she has been hurt—but continues to faithfully serve, pray and teach—has made me try that much harder to be the kind of friend she needs me to be. Here are some of the rules I set for myself, reminders of how to make the friendship enjoyable for her and not another obligation. Relationships thrive when you intentionally work on improving them. You, too, can adopt these ideas to help you be a better friend to someone in a leadership position. 1. Realize that she is both your friend and your leader. If you don’t respect her authority and leadership, you’re rejecting her personally. Some people want to separate the roles, happily embracing the fun friend while believing they are immune from their friend’s authority. Doing this, though, undermines the leader’s authority with everyone else in the church. Why should church members follow their pastors if their closest friends don’t? 2. Know that not everything is about you. The best friendships are a give and take. But in this type of friendship, in particular, you should err on the side of giving. A pastor’s wife is called upon to solve countless problems, often pulled into situations that ordinarily wouldn’t concern her. She probably truly does want to know what’s happening in your life, but sometimes your life needs to take a backseat to the issues she’s facing. Other times, she will welcome the chance to think about something else and will want to hear every detail. 3. Don’t ask questions she can’t answer. Pastors’ wives know quite a bit of personal information about those in the church. Respect the need for confidentiality and the sensitive nature of her position. She’s most effective as a leader when she is able to earn the trust of those who confide in her. 4. Be her safe place. Not only should you provide a judgment-free zone, but you can offer her a safe place to vent or work through issues. But only if you can stick to rule #5, below. 5. Keep her secrets. When she feels it is appropriate, she might confide in you. Don’t gossip. Don’t tell other people what she reveals in confidence. And if she does happen to tell you about someone’s struggles, do not let that change your interactions with or opinions of that person. As Christians, we’re called to forgive others of their transgressions—however we come to learn of them. 6. Know where the bounds of your influence end. Sure, offer advice like you would to any friend. But when it comes to leadership decisions, don’t offer unsolicited advice. Support her, ask questions if it seems appropriate, and help problem-solve if she wants your help. But know that your friendship does not entitle you to sway her decisions toward your self-interests. 7. Don’t use your friendship to get special privileges. Even if you are “best friends,” you will damage her position if you push your way into the forefront. Feel free to sit beside her sometimes. But know that it’s important to share her with the rest of the congregation because her relationships with others are integral in her role as a leader. If you’re jealous or possessive, it will damage her other relationships and your friendship will not last. 8. Be okay with coming last. This goes along with the previous point. Be intentional about creating opportunities to spend time with her, but realize that many situations will arise at the last minute over which she has little control. She may be late. She may have to cancel. If she doesn’t cancel, she may spend half the time you’re together on the phone talking to someone else. Be patient. She needs a friendship that can fit around and between the gaps in her schedule, rare as they might be. 9. Find ways to spend time together within the limitations of her schedule and responsibilities—inside and outside the church. Just because you’re friends, you are not required to volunteer for every church activity. But the fact that you are friends means you will want to help when you can. Go together to get the paper products and decorations for the upcoming ladies meeting. Ride along with her to visit new moms in the hospital or to pray for those having surgery. Attend conferences together when you can. And when she calls, suddenly finding herself with some free time, drop everything to join her for dinner and a trip to Target. 10. When you do have time with her, let her be herself. If she needs to talk about work or ministry or spiritual matters, let her. But if she wants to be silly and laugh, or buy a new pair of high-heeled shoes and eat chocolate, join in the fun. She’s a leader, but she’s also a real person who wants to enjoy all areas of life. 11. Maintain your spiritual life separately from her. Pray on your own. Study your Bible, read books, spend time alone in worship. What she needs more than anything is someone who will support her spiritually, someone she can walk beside rather than always leading. Be willing to learn from her, but don’t depend on her to carry the responsibility for your own faith. 12. Pray alongside her. If she asks you to pray about something, be diligent in doing so. She wouldn’t be a leader in church if she didn’t believe in the power of prayer, and this is one important way that you can be involved and help make a difference. 13. And above all, pray for her. Pray for her family, her ministry, her leadership, her spiritual walk, her closeness with God, her renewal, her energy, her passion, her friendships, her vision, her marriage. Pray for those who hurt her and challenge her, those who add stress or cause division within the church. Pray for those under her leadership as well as those she interacts with outside of the church walls. Spending time in prayer on her behalf is the most valuable gift you can offer her. This article first appeared on Crosswalk.com.